This predilection obviously influenced the South Korean director’s first English-language film, “Stoker,” which takes a small world, an adolescent girl’s, and then gradually expands it. Step by step, the viewer sees more, though the view reveals things that the girl, and the rest of us, may not wish to see. Park became one of the most acclaimed directors in his country by filming desecration, whether that’s desecration of the flesh in his vampire film “Thirst,” or violation of commonly-held ideas of decency and morality, as with “Oldboy.” For “Stoker,” written by Wentworth Miller, the violation begins slowly and elegantly. A teenage girl, India Stoker (Mia Wasikowska), wanders while reciting something to herself. What she says doesn’t make a great deal of sense, “We are not responsible for what we have come to be,” but that’s how Park works. He sets up sensations and atmosphere before diving into the plot. The main body of the film is a long flashback, circling back eventually to India’s situation. India’s father (Dermont Mulroney) has died in a horrible accident, and her mother (Nicole Kidman) seems polite enough on the surface, though withdrawn, not caring much for either herself or her daughter. India’s uncle Charlie (Matthew Goode) appears on the scene. India is startled, because up until now, no one’s told her anything about her uncle. Park wants to make horror elegant and stylized, and in collaboration with his longtime cinematographer Chung-hoon Chung, he hits his marks. An early shot of a cake with yellow-and-black stripes, hangs metaphorically over the rest of the story. Like the cake, uncle Charlie is sweet, possibly sickeningly so. Like the yellow, Charlie shines brightly. Like the black, Charlie’s dark side looms, threatening to overshadow the yellow. The weakest moments of “Stoker,” oddly enough, occur when Park has to push the plot points. Scenes of actual violence, rending air, destroying metal, glass, and flesh, feel forced. Park showed himself competent with this sort of thing in his celebrated South Korean films, but Miller’s script works best with indirection and suggestion. The film’s pivotal moment, when India watches her mother and Charlie secretly, works lyrically with suggestion. The man and the woman drink, and talk, and waver towards more than drink and talk. A song, “Summer Wine” by Nancy Sinatra and Lee Hazelwood, plays in the background, and then pushes to the foreground. It’s a thick, rich, song, a touch heavy and oversweet, like the cake. 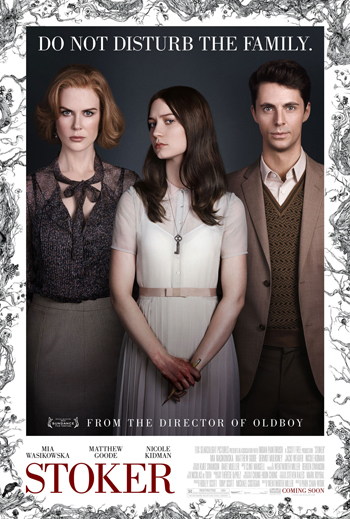 “Stoker” opens Friday, March 15th at the Lincoln Square Cinemas, 700 Bellevue Way N.E. in Bellevue; the Regal Meridian 16 Cinema, 1501 7th Avenue in Seattle; and the Sundance Cinemas, 4500 9th Avenue N.E. in Seattle. Check local listings for prices and showtimes. Andrew Hamlin can be contacted at info@nwasianweekly.com. I’m having some small security issues with my latest website and I would like to find something more risk-free. Do you have any solutions? I do consider all the ideas you’ve offered on your post. They are really convincing and will certainly work. Still, the posts are too short for starters. Could you please prolong them a little from next time? Thank you for the post. He believed in them and that given the chance these people will repay the loans. Beijing officials are not struck by the prestige of Xiaobo’s new distinction. Receiving fifty-seven votes out of sixty, Hammarskj. service each pouch. In this procedure, the digestive tract is shortened. Carl Edwards is the points leader and believe it or not he has NEVER won a race in Kansas. Phoenix race this coming weekend after only gaining 2 points from the Daytona 500.
of msn. This is a really well written article. I’ll be sure to bookmark it and return to learn more of your useful info. Thanks for the post. I will certainly return. They can cause you to gain fat and add to your cholesterol level as well. sometimes with the disorder going into remission. The weight loss also reduces their risk for several diseases. value at +600 in Crown Royal odds with 3-career wins at Richmond. titles in the last 13 races. I am grateful to acquire found this site. Hold up the very good postings.